It’s a lot of work to take care of an elderly relative with physical or cognitive health issues. From arthritis and diabetes to recovering from a stroke, seniors are subject to all kinds of chronic conditions that don’t allow them to live independently. Even basic age-related issues like poor vision and balance can seriously affect an elderly person’s ability to take care of themselves. When care duties fall onto a family member, they often find themselves battling with stress and exhaustion. Even in the best senior care situation, it takes a lot of work to look after the needs of another person, no matter what age or health condition. If family caregivers don’t recognize the common signs of exhaustion, they could develop serious health issues, both physically and mentally. Exhaustion is a chronic weariness of the body and mind that cannot be remedied by a night or two of good sleep. It requires serious lifestyle adjustments, and family caregivers that don’t get regular respite risk their own health and the health of their loved ones. However, they can be too proud or stubborn to ask others for help and feel like they can take care of everything on their own. Often, the first step in doing something about exhaustion is when family caregivers recognize the symptoms within themselves. Some of the most common symptoms of exhaustion include fatigue, lack of concentration, and poor focus on tasks at hand. They may withdraw from social interaction and experience mood swings, while adopting poor health habits. In time, they may exchange feelings of frustration with that of apathy. 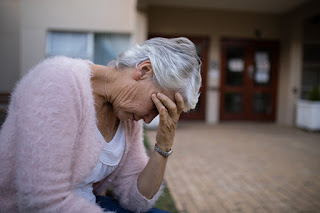 Other symptoms of exhaustion in family caregivers include ignoring personal hygiene, weakened immune system, and increasing accidents and mishaps. Hiring Elderly Care Providers Can Help. The best way to prevent exhaustion in family caregivers is for them to get adequate assistance in caring for their aging relative. Many hire elderly care providers as reliable and professional assistants that can help with the senior in the home. Elderly care providers can be scheduled for a wide range of times and do everything from light housework and meal preparation to dressing and grooming the elderly adult. Other duties that elderly care providers can take on are driving seniors to medical appointments, reminding them of when to take their medicine, and acting as companions when the aging adult would otherwise be alone. With elderly care providers on the job, family caregivers have the freedom to leave their responsibilities behind and focus on themselves for a few hours instead of their aging relative. Hiring elderly care providers gives exhausted family caregivers some regular respite, which is essential in keeping things balanced in their lives. If you or an aging loved-one are considering in-home elderly care in Birmingham, AL, please contact our caring staff at 205-490-1079. We service Birmingham, Vestavia Hills, Hoover, Pelham, Pinson, McCalla, Trussville, Adamsville, Chelsea, Mountain Brook, and Homewood.